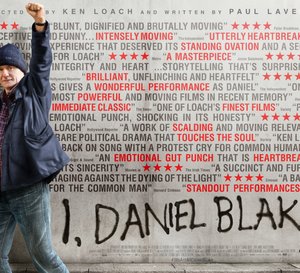 I, Daniel Blake follows the story of a joiner from Newcastle who has to stop work due to a heart attack and encounters the benefit system for the first time. The film follows Daniel through his “claimant journey” (to use DWP language) of applying for ESA, being told he is fit for work, and having to claim Jobseekers Allowance. In turns confused and frustrated by the system, Daniel is stuck between having to search for work to get his benefits whilst being told by his doctor he shouldn’t be working for the sake of his health. The director, Ken Loach, is known for tackling contemporary social issues in a powerful, realist way, such as his 1966 film Cathy Come Home about homelessness. When it was released, it made many people change their mind about homelessness and led to the start of the charity Crisis. I, Daniel Blake is another powerful film about our society, but this time Loach has focused on welfare and the benefits system. It has divided opinions, as some reviewers felt the film was unrealistic and made to make a political point, whilst others have argued that the film reflects many people’s experiences and that the government should change its policies. As a financial advocate who supports people with their benefits every day, I found some of the most heart-warming moments of the film to be when people took the time to really listen to Daniel and try to help him. These people included his doctor, one of the DWP work coaches and the benefits advisor who helped Daniel prepare his ESA appeal. It is important for everyone to remember that they don’t have to go through the benefits system on their own. There are organisations such as Citizens Advice Bureau that can help, free of charge, and plenty of advice websites including Turn2Us, Benefits & Work, and EntitledTo. If, like Daniel, you are found fit for work and need to make an application for Jobseekers Allowance or Universal Credit, you should also bear in mind that like every other organisation the DWP is required to make ‘reasonable adjustments’. This could mean changes to how many hours you need to spend searching for jobs or other parts of your claimant commitment (the things you need to do to keeping getting your benefits). Reasonable adjustments are a legal requirement to help people with a disability overcome the difficulties that are not faced by people who are not disabled. Reasonable adjustments can also be requested by other people, for example single parents who can’t look for work 8 hours per day as they need to pick their children up from school. It is important to be honest and make sure that the Jobcentre knows about anything that will affect your ability to look for work. If you agree to a claimant commitment that you can’t meet then you will be sanctioned and your payments will be stopped. This is where it can be really helpful to have an advocate in your corner. Someone who knows the system and can help you understand your rights and communicate your needs. Many people would find it reassuring to have someone support them through their benefit claim, but for lots of people with a learning disability it is additionally important as many don’t have the capacity to understand what is needed to manage their benefits. This is where Dosh tries to help. Dosh financial advocates support people using our considerable experience of disability benefits. We understand how benefits are changing and what the forms are really asking. We help people to complete benefit applications and ensure they are getting all the benefits they are entitled to, as well as challenging wrong decisions. We can’t help everyone, but our mission is for people with a learning disability to have independence and control over their money. Getting the right benefits is a key part of enabling people with a learning disability to have a good life. To reach out to more people, we share our experience and knowledge in other ways too. For example, we work with different groups and individuals to do research and create resources that can help people understand the benefits system. Our factsheets for family carers help families support their relative with their money and benefits. We would love to work with more self-advocacy and family carer groups in the future, to provide talks about how benefits are changing or workshops to help people build their skills. If you have an idea about how we can support you, please get in touch via our website or on twitter @DoshTweets.